Innovative Work-in Sleeve that protects hardware. Elasticated corners hold the hardware in place without affecting use. Dome protection that offers greater side impact protection to your Chromebook. 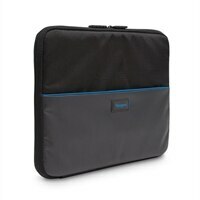 Targus Education Dome Protection 11.6" Work-in Sleeve - Black/GreyInnovative Work-in Sleeve that protects hardware. Elasticated corners hold the hardware in place without affecting use. Dome protection that offers greater side impact protection to your Chromebook.